Things have changed at grocery store checkout lanes and retailers everywhere. Initially, Oct. 1, 2015 was the date initially established for the majority of liability for credit card fraud to shift from banks to merchants – or to the party using the least secure technology. While this effort to crack down on credit card fraud encouraged merchants to install new smart chip technology at the point-of-sale did not result in a massive change over by the October deadline, we now are seeing more chip-enabled terminals in use and more consumers using smart cards. Another type of secure payment using smart phones, which debuted in the United States at about the same time as the smart-chip technology rollout, is making headlines, too. Here’s how these two new payment systems stack up. EMV stands for Europay, MasterCard and Visa and, as the acronym might suggest, EMV (or smart) cards have been the norm in Europe for decades. Our traditional magnetic stripe swipe credit cards are regarded in many countries as hopelessly outdated. The advantage for merchants to shift to EMV technology are obvious – financial institutions and card issuers will continue to be liable for fraudulent charges as they have been in the past with magnetic stripe cards. Consumers benefit from the encryption built into EMV cards that better safeguards their personal data. U.S. consumers have been quick to adapt to the new cards – simply pushing the smart chip card in a slot, plugging in a password (in some cases) and waiting for approval before removing the card. Merchants are having more issues – especially with concerns that the chip technology is slower than magnetic stripe cards. In situations where high volume makes speedy transactions crucial, problems caused by the slightly slower speed may be more perception than reality. However, the negative impression has taken root sufficiently to have caused Visa to develop a software upgrade to allow consumers to dip the card into the slot and remove it immediately. The technology that allows smart phones (and other devices like payment readers) to communicate when they are in close proximity is known as Near Field Communications or NFC. NFC is simple. To use Apple Pay, you hold an iPhone 6 or Apple watch up to an NFC reader. The device is held close to the reader – not more than a couple of inches away. The transaction is recorded very quickly and, because it goes through multiple layers of encryption, it also is very secure. All the so-called mobile wallets – Apple Pay, Android (Google) Pay and Samsung Pay – work pretty much the same way. Because they use fingerprint technology, a stolen phone can be locked down fairly easily. To find out where you can use a mobile wallet, look for the logo or a sign showing a hand with a card in front of a wireless signal. Where is this headed? Right now, many merchants accept payments using both new technologies, and manufacturers supply POS equipment that can read both. 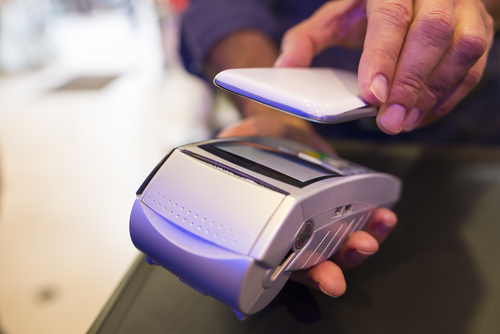 Will NFC technology supplant EMV technology? Only time will tell.